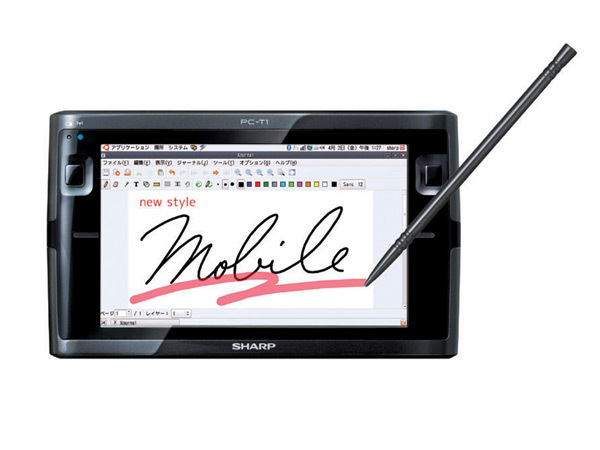 Sharp has just released it latest mobile internet device (MID) the Sharp NetWalker PC-T1 which has a huge resolution screen on a tiny 5 inch screen. The device only measures 150 x 90 x 18mm and weighs just 280g. The 5 ” LCD touch panel has a 1024 x 600 resolution and the device runs a Sharp customised version of Ubntu 9.04 ARM OS running FireFox, Thunderbird and OpenOffice.org to name a few. It also has an ebook reader with a link to Sharps ebook store with 25,000 titles available to download and is equipped with a USB , miniUSB / charger combination, microSD (SDHC compatible) card slot, voice input / output, IEEE 802.11b / g wireless LAN, Bluetooth 2.1 + EDR. This little device will be available in Japan shortly for 47,000 yen, around $510.